This is a great idea my coworker recently tried out on one of our more talkative clients. This rider wants to share everything that comes to her mind, to the extent that she doesn’t want to focus on riding, and if it gets too out of control will pout when asked to focus again, or even meltdown. A “Horse At Work” button. Before mounting she introduced the concept to the rider. 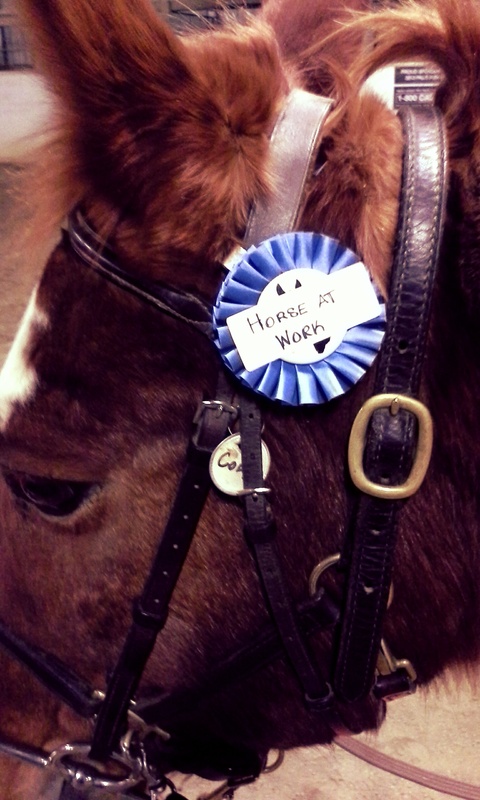 “Cody [the horse] has had trouble focusing lately, so I had to make him this button. Whenever I put the button on him, it means we all have to be quiet because it helps him focus. Can you help me with that?” I think she also explained that she as instructor can still talk. Right after the mount she did a practice round for half a lap of the arena. The rider cooperated right away. 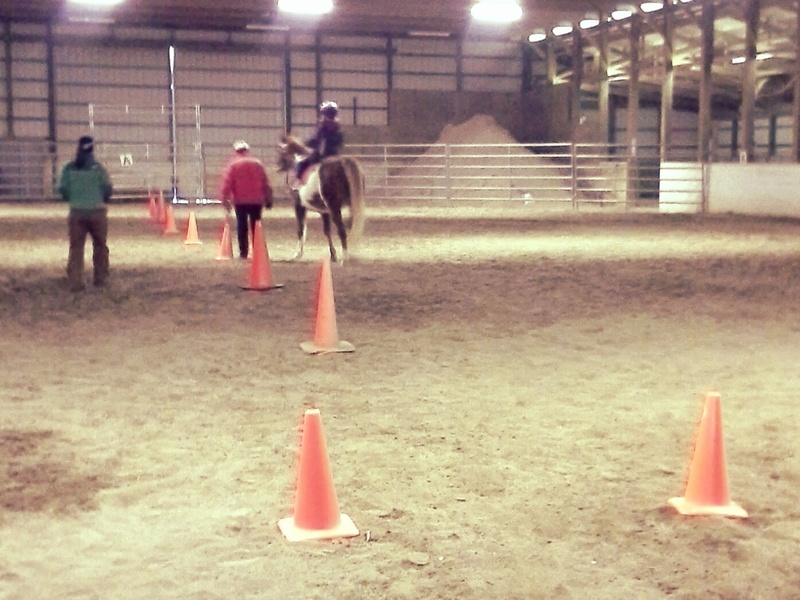 The instructor was able to give instructions while the rider focused and obeyed. Then they did warmups one direction, reversed directions, did another practice half lap of no talking, and did warmups the other way. Next the instructor explained we’re going to steer through the weaving cones and Cody needs to practice focusing so he’s going to wear the button. If he can go through the cones 2x with the button, we can take the button off and have a lap of talking, during which you can tell me anything you want. They did this twice. The second time the instructor added two cones before the weaving cones for the rider to learn to aim straight at the weaving cones before actually starting to weave. The concept is based on little rewards throughout the lesson for working hard. She explained the idea, did some practices, then let her rider for few minutes with the quiet button, then got a reward. She didn’t think she could go more than a few minutes, so she only gave her what she thought she could handle. Hope this idea helps someone out! Note: This is not professional advice, this is a blog. I am not liable for what you do with or how you use this information. The activities explained in this blog may not be fit for every rider, riding instructor, or riding center depending on their current condition and resources. Use your best personal judgment! Thanks! That’s a good idea. I have several clients that I can use this with! This is such an excellent idea. I love it!